Jesus cautions his disciples to remain alert and prepared for his return and the fullfillment of the Kingdom of God through the parable of the unwatchful servants. As disicples we are called to maintain our state of discipleship and kingdom readiness. In the parable, faithful servants were described as being able to answer when the master knocks at the door following his wedding regardless of the time of his arrival and thus maintain accepable ways of being. Like the unfaithful servants in the parable, disciples unwilling to remain awake and ready not only dishonor their Lord, Christ, they also take on worldly behaviors and practices that are contrary to Kingdom life and living. 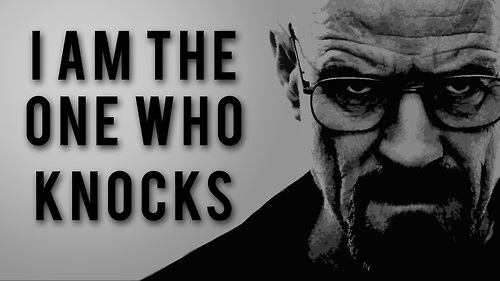 While Walter White believes mistakenly that he is the one who brings danger and knocks, disciples know it is Christ who knocks on our door bringing salvation or judgement. Faith practices and habits such as worship, prayer, service, worship and fellowship are ways disciples can maintain alertness and preparedness and avoid the temptation to live by worldly ways of thinking and being. 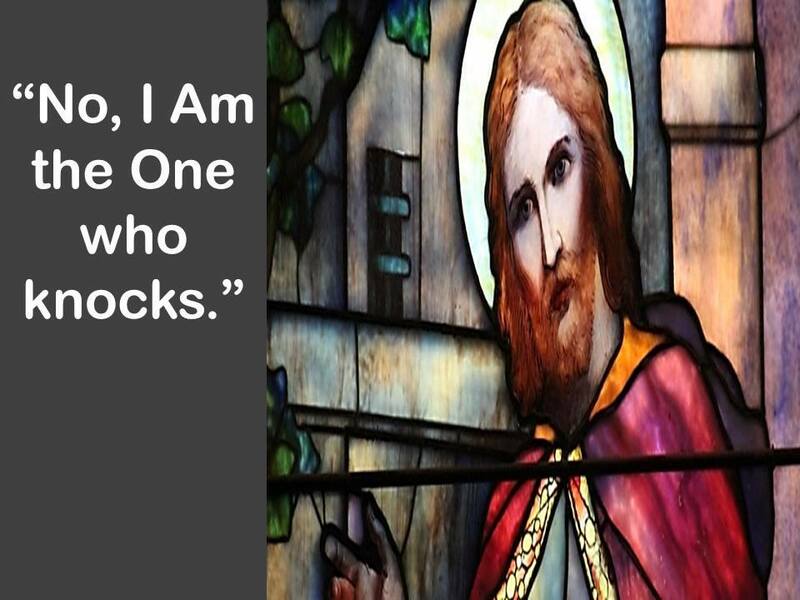 The second sermon uses the program to illustrate Jesus’s parable of the rich fool. In teaching the disciples and other followers to seek heavenly or true treasures and resist the temptation to see earthly riches as treasure to be stored and relied upon as a source of contentment and security. 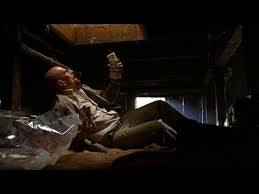 While the rich fool sought to store his treasure in barns, Walter White stored his treasure, drug money, in the crawl space of his house. As with Jesus’s teaching, Walter was foolish thinking his treasure was safe from decay or thieves, in his case his wife Skylar who took most of the money in an effort to cleanse her own deceitful doings, cooking her bosses books. As it ends up Walter, unlike the rich fool, is able to prevail temporarily against those who came for his life, Drug King Gus and his soldiers. Yet even as he wins against his enemies, Walter continues to breaking badly and his life and his soul recede further into decay. Most notably and tragically, the family, for whom he broke bad to protect, is decaying and breaking with and because of him. 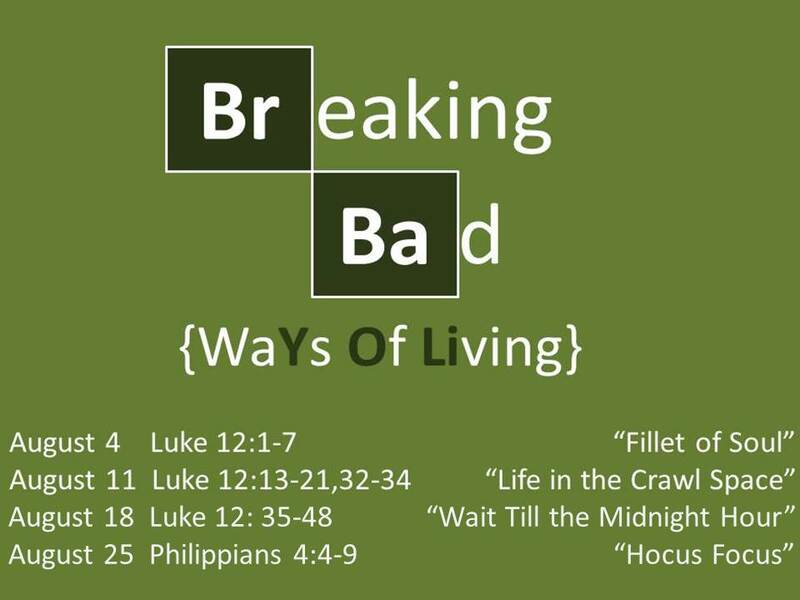 The first sermon in my Breaking Bad sermon series was “Fillet of Soul.” In John 12:1-7, Jesus teaches the disciples not to fear what kills the body but fear what kills the soul. 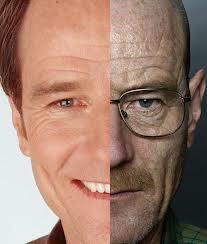 Walter’s breaking bad was his breaking toward fear rather than faith when life broke bad for him. He was so focussed and fearful of the impact his death would have on his family that he ignored the death of his and their souls. He had no faith in the ability of his wife Skyler or his special needs son Walter Jr. though difficult as it would be, to overcome his death, nor did he trust that loved ones would also care and provide support of the family in the event of his death. Walter allowed the end of their way of life as they knew it to justify the evil means he undertook to provide and protect them. He was blind to the real threat, that which truly could destroy not just their way of living, but their lives and fillet his and their souls. Fear over faith, is the source of most, if not all, breaking bad. Fear is the source of pride, greed, and other sin. Fear against God’s faithfulness was the weak spot the serpent used in the first breaking bad as described in Genesis, and is, in one way or another, the genesis all subsequent breaking in and of creation. This entry was posted in Faith Shots, Film Shots, Sermons and tagged AMC's Breaking Bad, Breaking Bad, Contemporary Christian Preaching, disciples, disicpleship, faithful living, I am the one who Knocks, jesus, Parables of Jesus, United Methodist preaching, Walter White. Bookmark the permalink.